I love Halloween. No- I really really do. It tops the xmas holidays for sure. Part of this is most likely due to my spiritual beliefs, but I just love the magic and joy of it all. This year is the FIRST YEAR EVER that we will receive trick or treaters. Because we have a house now. At one point this summer, when that realization hit, I literally hopped up and down in my seat, turned to look at Andrew as we were driving home from work that day, and chirped- "We're gonna have trick or treaters!!! SQUEE!". He loves me despite my crazies. Don't believe me? Two years in a row I carved a pumpkin in our former apartment in downtown Halifax, set it on the stoop and sat shivering in the lobby with a bowl of candy, reading my book and waiting for the trick or treaters that never came. One year I simply tagged alone a friend and their baby to mooch off the experience as they went trick or treating. And one year my friends agreed to walk around the more residential neighbourhood in Halifax, pretending as if we had somewhere to go, so that I could creep-out experience a smidgeon of Halloween. 1. The wastefulness of the holiday decorations. 2. The individually wrapped candy. Since there isn't a lot that I can realistically do about the candy (honestly, parents are going to compost whatever homemade or eco-friendly thing I give out), I have started planning in advance for the holiday decoration piece. Since I also have a huge problem spending money on a one-off holiday, particularly when the decorations are often plastic, cheap looking things, I've decided to DIY the crap out of this year. Saves money AND the environment. - To purchase natural decorations such as pumpkins and gourds from the local farmer's markets. 1. 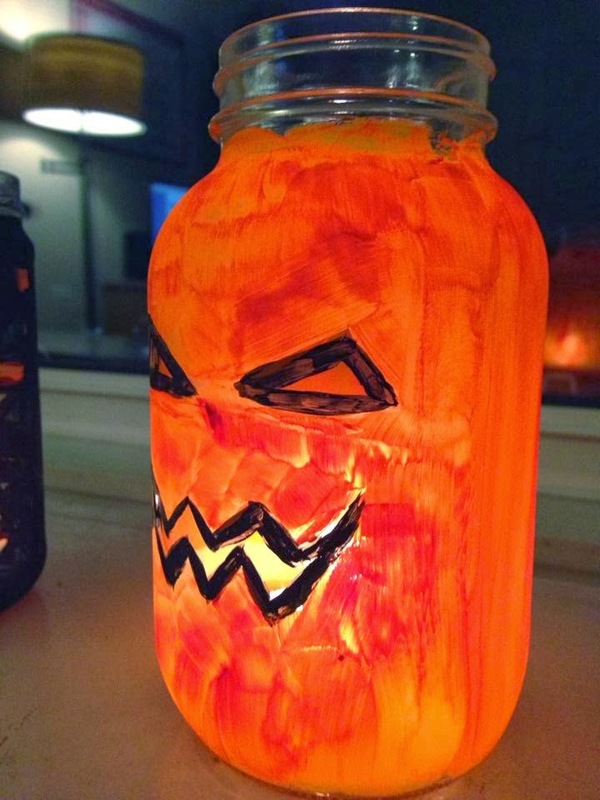 Painted mason jars and wine bottles as pumpkins and ghosts. I already did this last year and in the move the previous jars got recycled (sigh). I think these wine bottle monsters are super cute (although I won't be spray painting mine- they will be painted using paint I already own). Now these are going to be amazing. I have three weird little bottles and a few jam and honey jars that are going to be PERFECT for this. Just clean off the labels, tape on the printed apothecary labels, maybe add some weird little stones and sticks or liquid and VOILA! I saw this and thought- wow except for the ridiculous amount of cutting, I can do this! These probably won't last for next year (although I will try to save as many as possible), but it's cheap, relatively easy on the planet and will look amazing. These little dudes just look SO CUTE all in black. It took a few tries to free cut the first template (surprisingly tricky to get the bottom angles right), but once I had one it was super fast going to cut the rest. These are another "might not last for next year" but here's to hoping! This is all me. I saw some creepy framed pictures at Home Sense and thought- geez, I could totally do that at home. I happen to have a gifted tarot deck that I never use. The images are vintage and FRENCH which is neat. I also had a bunch of frames that we weren't using. A bit of paint and voila! 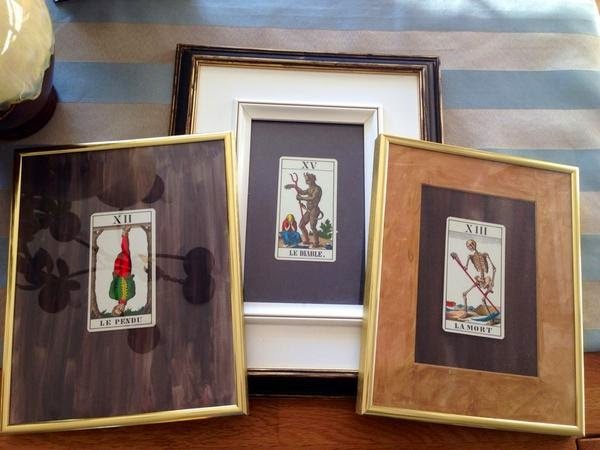 I plan on replacing some of our current art with the tarot cards. THIS is the pièce de resistance... and will take the most time and effort but I AM PUMPED. The "sky" is my old hemp shower curtain (that kinda got moldy and I ended up cutting too much off the bottom). 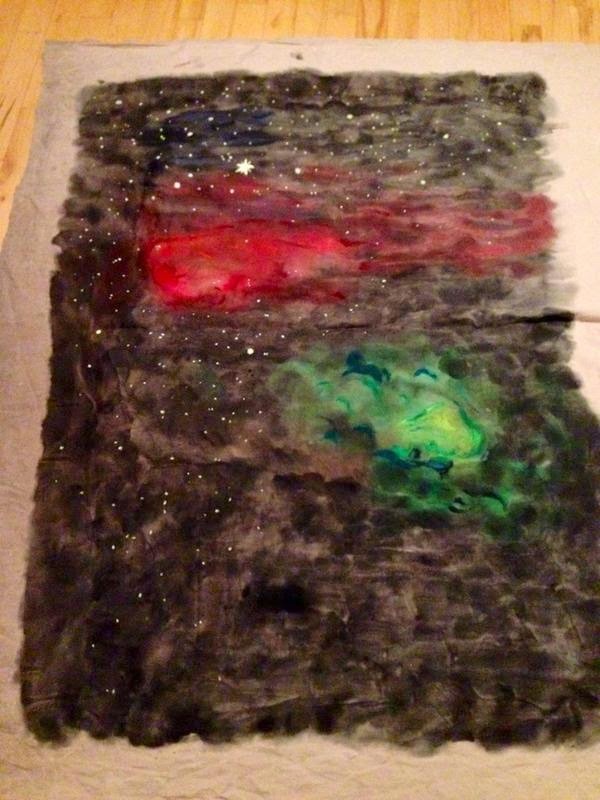 I'm painting my attempt at a night, nebulous, starry sky. 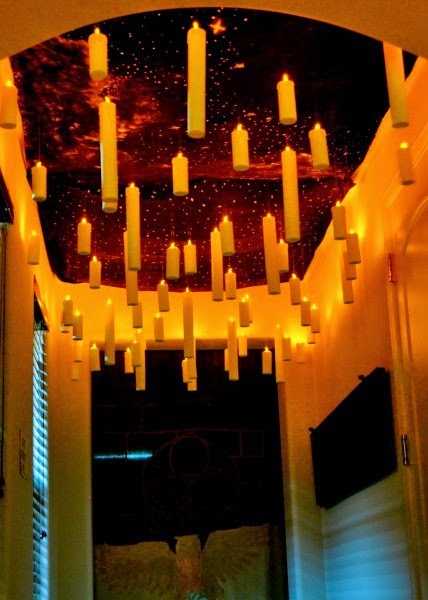 I think in the dark it will look just fine... And the candles are simply toilet paper and paper towel rolls painted to be candles with LED candles attached on top. Since we are a paper towel free household, I have two friends donating for the cause. Are YOU ready for Halloween?? Share your amazing DIY projects and ideas in the comments! Ok, I want to come visit your house! This makes me want to make some Halloween decorations to put up at work. I live in an apartment and I don't really like strangers, so I probably wouldn't give out treats anyway. Though last year I did bake cookies and bring them to work. Awesome ideas! I love DIY decorations from stuff already floating around the house (pun intended).